After detracting from economic growth for a number of years, the U.S. housing market is in a position to be a positive contributor to growth. The supply and demand dynamics in the housing market are attractive. Supply is at low levels. According to the National Association of Realtors, the supply of available homes is currently 4.2 months, down from over 12 months at the worst of the market. 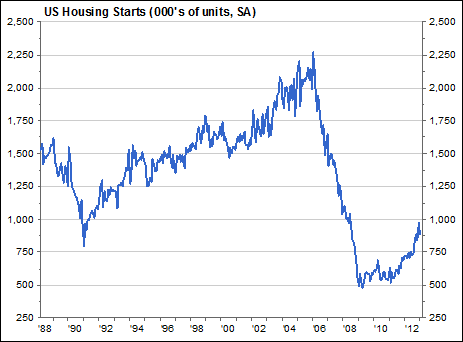 New housing starts have improved, but are still at levels last seen in the early 1990s. There are also fewer foreclosed properties on the market. CoreLogic reported that 1.2 million properties were in some stage of foreclosure in January, a 21% year-over-year decrease. Finally, investors (both individual and institutional) have been snapping up properties in previously distressed markets. Some owners are waiting for higher prices to put their homes on the market. However, prices are firming by a number of measures. The S&P/Case-Shiller National Home Price Index gained +7.3% in 2012. CoreLogic’s Home Price Index gained +9.7% year over year in January, the eleventh consecutive monthly increase. 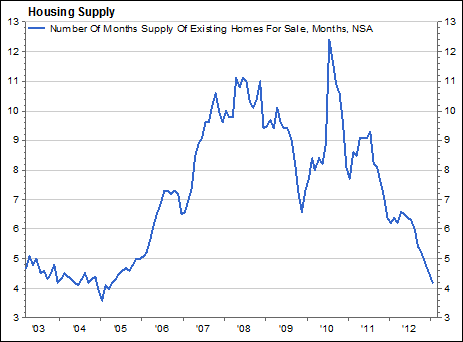 Tighter levels of inventory have likely led to higher prices in recent months. However, rising prices will eventually encourage homeowners to sell and builders to build, adding to inventory and thereby slowing the rise in prices. The demand side of the equation is also positive. There is pent-up demand for new housing that has built up over the last few years as households have been formed. Additional job growth will create more demand. Affordability is still at very high levels with interest rates at record low levels. If interest rates start to move higher, it could be a trigger for fence sitters to move. Guidelines are strict for obtaining a loan (I can attest to this with my personal experience over the last month), but credit is being extended. The constructive dynamics in the housing market should be a positive for the economy over the intermediate term. There are additional benefits to the economy that stem from an improvement in housing – consumers spend on appliances, home improvement (I’ve visited Home Depot or Lowes every other day in the last few weeks), contractors, architects, etc. In addition, stable and rising home prices will also serve as a boost to consumer net worth and confidence. Municipal bonds have delivered very strong positive returns since Meredith Whitney famously predicted hundreds of billions in municipal defaults during a 60 Minutes interview in December 2010. Municipal bonds outperformed taxable bonds (Barclays Aggregate Index) by meaningful margins in both 2011 and 2012. 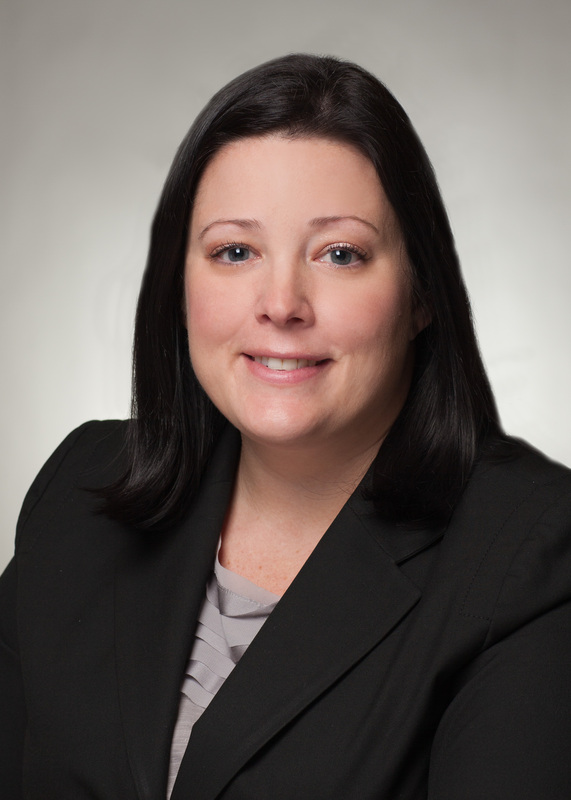 Municipal bonds have benefited from a favorable technical environment. New supply over the last few years has been light, and net new supply has been even lower as municipalities have taken advantage of low interest rates to refinance existing debt. While supply has been tight, investor demand for tax-free income has been extremely strong. Investors poured over $50 billion into municipal bond funds in 2012 and added $2.5 billion in the first week of 2013 (Source: ICI). This dynamic has been driving yields lower. The interest rate on 10-year munis fell to 1.73%, the equivalent to a 2.86% taxable yield for earners in the top tax bracket. Similar maturity Treasuries yield 1.83% (Source: Bloomberg, as of 1/15). We expect new supply to be met with continued strong demand from investors. While technical factors have helped municipal bonds move higher, the underlying fundamentals of municipalities have also improved. States, unlike the federal government, must by law balance their budget each fiscal year (except for Vermont). They have had to make the tough choices and cut spending and programs. Tax revenues have rebounded, especially in high tax states like California. Last week California Governor Jerry Brown proposed a budget plan that would leave his state with a surplus in the next fiscal year, even after an increase in education and healthcare spending. Stable housing prices will also help local municipalities who rely primarily on property tax revenues to operate. 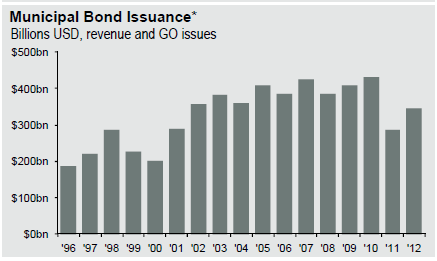 While we think municipal bonds are attractive for investors with taxable assets to invest, the sector is still not without issues. The tax-exempt status of municipal bonds survived the fiscal cliff deal unscathed, but the government could still see the sector as a potential source of revenue in the future which could weigh on the market. Underfunded pensions – like Illinois – remain a long-term issue for state and local governments. Puerto Rico, whose bonds are widely owned by municipal bond managers because of their triple tax exempt status, faces massive debt and significant underfunded pension liabilities and remains a credit risk that could spook the overall muni market. As a result, in our portfolios we continue to favor active municipal bond strategies that emphasize high quality issues.